Now that Thanksgiving is over, many families are putting up their Christmas trees. If you are one of those families who love a real conifer, then you are probably already on the hunt for a good one. But finding the perfect tree is just the start; you must also do what’s necessary to ensure it stays perfect once it is in your home. Basically, it all comes down to routine tree care. Be sure you are prepared to take good care of your Christmas tree if you want it to retain its freshness, luster, and fragrance all month long! Continue reading to learn some important maintenance tips for live Christmas trees, including how to prepare them, water them, and more! A Christmas tree will not require the same type of routine maintenance as would a tree that is planted in the ground with an attached root ball. Since Christmas trees have a severed the root ball, there is no need to provide it nutrients or sun; it will not be growing anymore. However, there are a few important things you can do to retain its freshness and appeal for as long as possible. Use the following tips to make your Christmas tree stand out among the rest! If you have not already purchased and set up your Christmas tree, then be sure to make a fresh cut off the base of the trunk (at least one inch from the bottom) before you bring it home. You can ask the tree salesman to do this for you, or you can use a saw to do it yourself. A fresh cut allows the tree to intake water more efficiently, rendering more beautiful foliage and fragrance. Although Christmas trees and fireplaces seem to complement one another, they are not good neighbors. Not only can a live Christmas tree be a fire liability, heat sources in the home can accelerate evaporation and moisture loss in the tree. This will surely shorten its run. In addition to fireplaces, avoid setting up your tree near heat registers, space heaters, wood stove, TVs, computer monitors, and anything else that gets hot. As soon as you have your freshly-cut tree placed in its stand in the spot where you want it, immediately give it some WARM water. A good Christmas tree stand should be able to hold 1 gallon of water or more, so give your tree as much as the stand will hold. In fact, it is common for a standard-sized Christmas tree to need 2 gallons of water on the first day it the stand. Do not to use any additives in the water, as there is no reason to since the tree is already severed from the root ball. Furthermore, such additives can cause premature moisture and pine needle loss. Scientific research has shown that tap water is best for indoor trees, so just use regular water from the sink to water your Christmas tree. Since you fill up the stand all the way, you do not have to water your Christmas tree every day. Instead, just check on it daily to ensure the water level has not dropped below the trunk base. If the cut section of the tree trunk is not in water, the base will seal up. So when the water level is close to the bottom of the Christmas tree, fill up the stand again with more warm water. ✨ Keep an eye out for next month’s blog about recycling your Christmas tree! 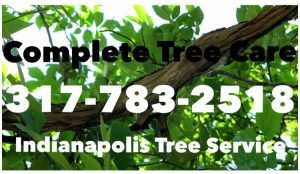 Call Complete Tree Care at 317-783-2518 for professional tree service in Indianapolis and throughout Central Indiana. We are highly trained and qualified tree care who provide a wide range of tree services for both residential and commercial properties, including tree trimming, tree pruning, stump grinding, stump removal, lot clearing, and much more. When you need quality tree removal services at a fair price, you have come to the right place! This entry was posted in Tree Care and tagged christmas tree care, christmas tree watering, Indianapolis tree care, Indianapolis tree service company, tree care advice, tree service Indianapolis. Bookmark the permalink.